Posted by Rebecca Hoover in Testimonials - stories from real people who have beaten MS.
March 2009 photograph of Julie Calder practicing yoga at age 43--taken 11 months after starting an MS diet. 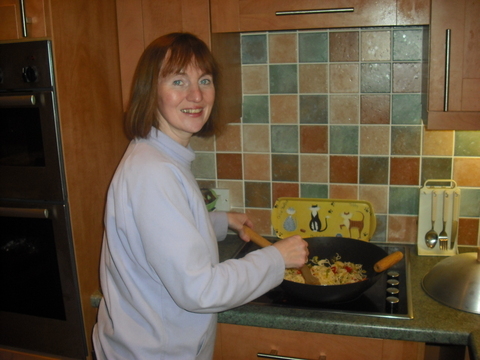 Julie says she believes the diet not only helped her get rid of MS symptoms, it also improved her appearance. 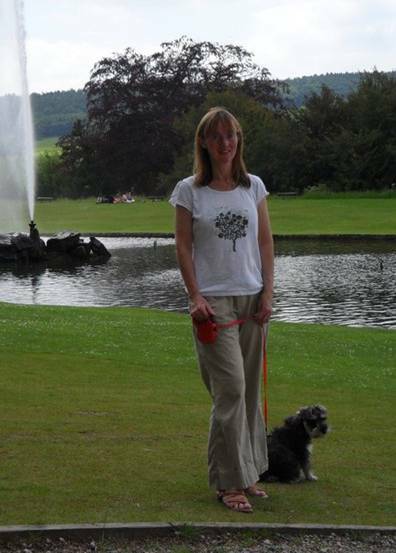 From Julie in England: I was diagnosed with relapsing-remitting multiple sclerosis (MS) on September 4, 2004, but I had been having symptoms since about September 2000. My first symptoms were tingling in my fingers and toes and a sensation of sunburn down my right leg, for no apparent reason. These were dismissed as “probably a virus” by my primary care physician. In subsequent years, I suffered from inexplicable tiredness, which I now know was MS fatigue. In 2003, I had problems with my vision and I was diagnosed with “convergence weakness” and given eye exercises to do — these did not seem to help much. By this time, we also knew that my sister had MS and her case was severe. She had been hospitalized, had temporarily lost the sight in one eye, and was finding it difficult to walk. This was when I started to research whether MS was genetically related or not and I discovered that I had about a 1 in 40 chance of getting MS, because my sister had MS.
Next I experienced dizzy spells and hand tremors; and I saw a specialist. He did not think I had MS (he thought it was myalgic encephalomyelitis, also called chronic fatigue syndrome) because I could still walk in a straight line and stop my hands from shaking if I concentrated hard enough — for a few minutes, anyway). I asked him to order an MRI scan–he agreed “just to set my mind at rest”. Later he said, “you could have knocked me down with a feather” when he saw the white areas of demyelination on my brain scan. I had to pester him for the result of my MRI, and I eventually received my MS diagnosis–over the telephone! My eyesight seemed to improve of its own accord, but I started losing my sense of taste, which was very strange and a bit worrying. Also, I was under a great deal of stress. My Mum was ill with lung cancer which upset me a great deal, because we were very close. It was while I was going back and forth to Manchester to see her in hospital that I realized that I was suffering from a new symptom — foot drop! This meant that I had a noticeable limp and I was no longer able to walk long distances. My eyesight became weaker again, but only for a few months. To cut a long story short, my Mum passed away in January 2005, at age 62. My Dad, my two brothers, my sister and I were all devastated. Sadly, my Mum’s death seemed to send my sister with MS into a downward spiral of many relapses followed by incomplete remissions. My Dad never got over Mum’s death, and he subsequently passed away less than two years later at age 69, of pancreatic cancer. To add to my stress, two days after my Dad’s funeral, my husband was diagnosed with colon cancer and he was operated on just before Christmas, 2006. From the beginning, however, he was determined to fight the cancer; and he inspired me to fight my MS. We had a difficult time while he went through six months of chemotherapy, but we survived to tell the tale and I remained stable. It has now been just over two years since my husband’s operation and his most recent CT scan gave him the “all clear”. Needless to say, we and our three sons (ages 15, 12 and 10), are feeling a lot happier and we are all enjoying life again! My MS, however, continued to be problematic. Then, last year, I came across George Jelinek’s book; and I was impressed with his well-researched ideas about diet and how to live your life to “take control of multiple sclerosis”. I have been on his diet ever since. My first improvements, after starting his diet, involved reduced fatigue and less anxiety. Prior to starting his diet, I often felt anxious — worrying about day-to-day things — very much out of proportion to the likelihood of them actually occurring. A few months after starting the diet, I actually felt my spirits had been “uplifted”. Before long, I also realized that my foot drop was considerably reduced and I had loads more energy! My balance problems and problems with hand tremors also disappeared almost completely. I was thrilled. Six months after starting the diet, I realized that I was not taking enough Vitamin D, so I increased my dose from 1,000 IU to 5000 IU; and wow! It was as though I had taken another quantum leap up the scale to good health! I have now been on the diet for 10 months, and I would heartily recommend it to anyone with MS. I should mention that I do exercise and this helps me feel strong and the exercise addresses specific problems. For example, I swim about once a month, do yoga once a week and do exercises every night to strengthen my ankles and feet. I am trying to persuade my sister to go on the same diet, because she is now able to walk only with a walker. I think my suggestions are starting to get through — she is now taking Vitamin D and Omega-3 fatty acids, but probably not enough yet. Eat absolutely NO red meat, however I still have chicken (breast only) about two times a week–this is more in keeping with Dr. Roy Swank’s diet (Dr. Jelinek suggests no meat, except fish, at all). Eat lots of fish, especially mackerel, tuna, salmon, lemon sole and prawns (yum!). Eat absolutely NO dairy products, not even cheese if I can avoid it. I use soya milk with my cereal in the mornings (porridge with apple and raisins, usually). I eat brown bread with seeds on top. To accompany the fish or chicken I eat, I have rice, pasta or potatoes and whatever vegetables I fancy, usually broccoli, cabbage, carrots, mange-tout, and onions. I sometimes saute or stir-fry vegetables with a small amount of extra virgin olive oil, or bake them in the oven after coating them with a small amount of extra virgin olive oil first. I also eat absolutely loads of tomatoes and red and green peppers, especially in my Italian-style dishes. I add tomatoes to my curries, along with cardamon, cumin, garlic, chilis, and peppers. To my Chinese-style dishes, along with baby sweet corn, I add soy sauce, ginger etc. If I need something sweet, I have either alpro-soya yogurts or alpro-chocolate or caramel desserts. Alternatively, I have fruit with either alpro-soya cream or non-dairy ice-cream (Swiss glace). For snacks I have fruit or Mrs. Crimble’s low-fat ginger cake or Dutch apple cake, or oat bars with cranberries and apple. I love cooking and I have never once felt deprived. If you met me, you would not know I have MS—I am much healthier than I was before I started following Jelinek’s and Swank’s recommendations. I still have MS (for example, I still experience foot drop after walking a couple of miles) but I also now have hope. I believe that my children will be glad their Mum is taking care of herself. My improved health makes life much easier for everyone. A most interesting account of the problems of MS. Dieting methods can be helpful in coping with the problems of MS.
No one in my family has MS. I have had MS symptoms for 25 years. I am 69 this year. I can still walk (slowly and with stick) and use a scooter for long distance events. I drive a car. I have never had any drug therapy. Once a week for twenty years I have used HDOT (High Dosage Oxygen Treatment) which helps in the management of ms symptoms and is shown long-term treatment can slow down the progression. There are 60 plus charity MS Therapy Centres around the UK and the Republic of Ireland where HDOT is available. Thank you for letting us know about your experience with MS and about the charity therapy centers in UK and Ireland. I am glad you enjoy high dose oxygen therapy. I do need to mention, however, that the research shows that this therapy does not slow the progression of MS. It may be that this therapy is enjoyable, just as a good massage is enjoyable. This use of oxygen, however, cannot replace approaches such as eating a healthy low-fat diet, exercising, sleeping enough, avoiding malnutrition, etc. I am glad to hear you are doing quite well. You might be interested to know that many who follow the Swank MS diet, are dashing around at age 80, without walking sticks. It is never too late to start a healthy eating program! Sorry to hear you have had such a bad few years. But i very happy for you that you are now on the UP. I found all that you have written very interesting and i am going to get the books and give it a go. And see if i can inprove my quality of life. thankyou for putting all this information on here and how it has helped you. I hope you sister can have the same success with it. Thanks, Julie, for sharing your story. I have been on the Swank diet for a little over a year now and have seen substantial improvement in my MS symptoms. I have a progressive form of MS (RPMS) and the diagnosis devastated me. Finding the diet gave me some hope that I could control the outcome of my disease and so far I couldn’t be happier. I also take a lot of supplements, including fish oil, Vit. D, B complex, and C and selenium. I take Vit. B-12 shots once a week and I take LDN 4.5 mg. every night. Hope you and your husband both continue to enjoy good health. Julie, That is a well-written and comprehensive story of your MS history. Thanks for providing all that information. You are a good ambassador for the benefits of a healthy diet and life-style in the battle against MS.
How low does it take for you to get over a relpse. I started having a relapse that is effeting my legs. I can walk with a cane but only walk or stand for about 15minutes. I’m taking LDN and haven’t had any problems but recently have had a really bad diet eating lots of fast food recently and I guess now I’m really paying for it. I’m still taking LDN and just started following Dr Swank’s diet but not to the letter. About how long does it take you to get over a relapse on Swank’s diet. When I used to have relapses of the type you are having, it would take six months to recover. When I started behaving myself the relapses started occurring much less frequently (I have not had one for about nine years) and I recovered from them in less than three months. Also, the relapses became more and more mild. I hope your legs get better soon. Remember, the important things to do are eat right (follow the Swank MS diet to the letter), take Vitamin D, Vitamin B12, and fish oil supplements if needed, and rest, rest, rest. Bed rest is very important. I used to spent up to 16 hours per day in bed when I had bad relapses. Not all of this was spent sleeping. I also worked on my computer, read, etc. I am worried about your use of LDN, LDN is a mood altering drug that is used in the treatment of addictions and I think it may be improving your mood so you believe you MS is better when your MS is really just as bad as ever. LDN causes an increase in endorphins which create an enhanced sense of wellness. I have seen people take LDN, experience with they believe was an improvement, perhaps because of the mood elevation, and then have a big crash–a major relapse. This makes sense to me. I’m guessing that people overdid things because of the mood enhancing effect of LDN. And, of course, overdoing things would cause a relapse. No one really knows, however, if LDN helps MS, has no effect, or makes matters worse. It is important to note that the preliminary studies that have been done show LDN results in relatively mild improvements but these studies have not extended beyond a few weeks. The preliminary studies do not show what happens to individuals when they take LDN for more than a few weeks. Please be sure to see your doctor regularly too. The information on my site is intended to be used in discussions with your doctor. Good luck! And hang in there. Relapses are scary but by really following the Swank MS Diet and taking care of yourself, you will find you will feel much better. You will also start looking great too. When Swanky eating becomes a habit, you will never want to go back. I’ve now been on the diet for 14 months and I managed to walk 2 miles on Monday with *NO SIGN* of foot drop!! I really feel that it is the diet (plus supplements) and lifestyle which have helped to achieve this. The only problems I ever have are when I veer off the diet. Dairy products, in particular, tend to upset my system a lot now and it takes a few days to get ‘back to normal’. It takes a lot to stick to the diet – there are so many temptations out there that it’s hard to say ‘no’ sometimes. But it is really worth it in the end! Good luck everyone and ‘be strong’! I was diagnosed in 2000, in a wheelchair by 2004. Standard therapy didn’t help. But intense, directed nutrition did. Now – I bike to work (5 miles) and could take a trail ride by horse back in the Canadian Rockies. If I go off the diet — I decline sharply for about a week. the food matters. A great deal. Thankyou so much for posting your inspiring story Rebecca !!! My question for you and the others who posted on here about how the diet helped is that how long after you first started did it take to notice the earliest symptoms to disappear? One week, two weeks, month, three months etc. and again thankyou to everyone as i’m going to start right after the Christmas holiday season as i hate this disease and now feel inspired. I’m glad our stories helped. That is why we took the time to write and post them. We wanted to show real people who have seen real changes in their lives after starting an MS Diet and a healthy living program. If you start doing what we recommend and that includes doing the diet, taking at least 4000 IU of D3, etc., you will probably notice a difference within a week. At first one feels slightly less fatigued. The saturated fat in a diet and unhealthy food really drags one down and saps the energy. Within a month, I’m guessing you will start feeling a little bit stronger. In six months, you’ll feel enough better than you will wish you had started to behave yourself a long time ago. LOL All in all, it takes the body about two to three years to clean itself out after you start eating right and doing the other things we do. Swank said it takes about three years. Also, I’ve seen some research that said that when men start following an improved diet, it takes about two years to resolve an erectile dysfunction problem that was caused by eating unhealthy food (that happens frequently). In summary, it seems to be consistent across diseases–an improved lifestyle takes about two to three years to fully kick in. Of course, this should not be interpreted as medical advice. I’m just telling you what happened to us and about research I’ve seen. It is always good to get your doctor involved. A lot of docs need to be educated on Vitamin D3 and MS, for example, because the research on this is new. Even so, a good doc is very helpful and does things like run Vitamin D tests that allow you to track how you’re doing. Also, I have had some great physical therapy over the years and can’t recommend that enough. All the best. Please keep us posted and let us know how you feel after you’ve started. I’d love to know how you are doing in a month, after three months, etc. Well thank you so much for your answers to my earlier post as i see that i just need to patient and in time good things will happen and also i’m bookmarking your site to my ”Favorites” so i can check back often and i will post every so often to let you and others know how it’s going and again thank you for your site and insperation. Thank you for posting this. I am on here because there is a chance that my wife could be diagnosed with MS. One piece of luck she does have is that I have had some contact with MS and have long been interested in complimentary therapies (I am a qualified masseur). I knew that diet would probably have some effect on MS but reading this I know that it is much more marked than I thought. I would like to wish everyone all the best in their own personal battles. I hope it is not one we have to have but if it is I will use this site as an initial reference point. It is heartwarming to hear people using the power of the body and it’s intake to beat something so cruel. I am feeling so much better already. No more fatigue, and as soon as I took a megadose of Vitamin D to get my level right up to Dr Jeleniks recommendations, my balance started to improve. I can now walk 200 metres before needing my cane. I sleep well at night, and don’t need afternoon naps. The omega 3’s have been great for my skin and hair, and I have lost 6kg so far which is another bonus. If I stay at this level, I will be content but do hope that over time I will improve even more. I hope my story helps. It is amazing what the right diet, Vitamin D, B12, and some fish oil will do for MS as well as beauty or handsomeness, isn’t it? The program is worth following just for the improvements in appearance alone! Too bad we didn’t know all of this before, isn’t it? I have been on a dairy free, gluten -free diet with high vitamin B C &Zinc and vitamin D for many years, almost from my diagnosis 27 years ago. Nevertheless my illness progressed though very slowly until at. 60 I now need a cane because of stiffness affecting my balance However I began taking LDN 5 months ago and since then have no bladder problems especially urgency which bothered me badly for years, I have no clonus or restless leg syndrome, no fatigue and I sleep like a baby. I see no difference in my emotions as I have always been very positive and spiritual. This is the only medication I have tried and only because of patient reccommendation. There were noside effects whatsoever and it is very cheap. Thanks for your comment. Following an MS diet is quite important, I think, because keeping saturated fats to a very low level is key as is following an anti-inflammatory diet. Also, I notice you did not mention you take fish oil which I think is important to those with MS.
Good luck on the LDN. Because there are no real scientific studies on LDN, it is hard to know if LDN is working or if it is just a placebo. The one scientific study that was done found that LDN elevates the mood. So, it could be you are more optimistic just because LDN does that. In any event, best wishes! I encourage everyone with MS to follow an MS diet because I think that is key. I am also trying LDN to remove my last remaining symptoms of (much reduced) fatigue and bladder problems. So far the results are looking very promising (but I’m only taking 2.5mg so far!). I think it is very important to continue to stick with the diet ‘though! You replied to my comment over at Man on a MSion and now I’ve “met” you over here! Both your and Rebecca’s story are fantastically encouraging. I’m convinced now that I need to order the Swank and Jelinek books. I’ve been building my treatment plan from what I’ve read in the Paleo Diet and Anti-Inflammatory diet books, and various articles and blogs online. There are a lot of similarities, but I would like to arm myself with as much information as my MS brain can contain. Based on what you posted about your diet, do you get most of your protein from fish? Hello again! I tend to eat fish several times a week, but I also eat chicken quite often – this is more in keeping with Swank’s diet rather than George Jelinek’s diet. I always have soya milk on my cereal, so I suppose that’s more protein too! I also adopt Roy Swank’s approach to eggs – he allows us to eat up to 3 a week, which I usually have as mayonnaise with my tuna! By the way, there are some ibuprofen preparations that are OK ….the ones I know about in England are ‘liquid capsules’ and ‘meltlets’, the latter you can take without water -you ‘crunch them’ and they dissolve on the tongue. They are more expensive, of course! But lactose-free which is the important bit. I last posted in April, and I’m pleased to say I continue to improve. I’m still following the diet and supplements, it has become a way of life for me know. I don’t take any drugs so it’s amazing what this diet/regime has achieved. I have stopped losing weight and have plateaued at 60kg, a good weight for me and what I weighed in my 20’s, and a total loss of 12kg. Even better, I have managed to do a 3 kilometer forest walk – the furthest I have been able to walk for 5 years. I am also doing regular Pilates and Tai Chi. Congratulations on the improvements. Your work in beating MS with life style changes is inspiring to others too. After one has does this for a while it begins to feel like common sense, doesn’t it?. After all, when we get rid of any nutritional deficiencies, start eating healthy, start exercising and sleeping enough, etc., of course we will feel better. Congratulations again! Keep up the good work. hi there. I just got a diagnosis and just finished iv steroids now just feeling rubbish. I have babies and older children and i am 41. Ive ordered the books you mention and intend to do all i can to manage this. At the moment i have trouble walking limp and drop foot and im very scared but i smoke and need to stop that asap but im concerned my stress level will rise. This relapse has been for 4 months now and i lost my brother and had a baby in that time. Im praying the steroids get me walking again and i intend to totally change my way of life because my children need me. Any advice or encouragement will be most welcome as im feeling daunted right now. Thank you. Dear Denise, Thanks for letting us know your situation. It sounds as if you have been through a very, very tough time. Here’s some information for you: First, smoking is so unhealthy that it causes far more damage than stress can cause. It is very, very important that you quit immediately. The research shows that smoking probably helped cause your MS and will make your MS worse. If you want to be well, you must quit smoking. Quitting smoking is not so difficult once you put your mind to it. I know, because I used to smoke myself. Second, if you do quit smoking and stay away from the drugs such as the interferons that can make MS worse in about one-third of cases, you are likely to do okay in the longer term. It takes about six months to recover form a relapse so you are still in the midst of your nasty flare up of symptoms. You are very smart to plan to make life style changes. You will be doing your family a big favor too. When you whole family starts living healthier, you will all be healthier, happier and even more attractive. Please keep us posted and try not to be too upset. Making life style changes makes a big, big difference and most likely better days are on the way. Thank you so much for that. Ill be stopped within a week and while i wait for the books to arrive ive just packed my fridge with soy milk and soy spread salad fruit and wholegrain bread! Not sure what im doing yet but i thought id better make a start. I want to buy seeds to eat but have no idea what to buy. I have lived in such a bad way diet wise so this is very new to me but i will not let my children down. Again thanks so much for your reply. There is an amazing abundance of healthy food to eat and enjoy. While you are waiting for the books, please check out these links http://www.overcomingmultiplesclerosis.org/Recovery-Program/Diet/Foods-to-Enjoy/ and http://www.overcomingmultiplesclerosis.org/Recovery-Program/Diet/What-Not-to-Eat/ . Also, I eat unroasted and unsalted walnuts and sunflower seeds. Yummm! You will learn to love them. hi again. Well im still muddling through but sticking to it. I was starting to feel a little more energy and numbness in one hand has much lessened. Yesterday i did more than usual and didnt rest. At night i treated myself to a glass of red wine and a kebaa. . Chicken tikka on white pitta with mint yoghurt. I had only two bites of the pitta. Today i feel shocking. Have slept for 3 hours already. Do you think this is diet related. Also yesterday although i had more energy i had some seeds which were lovely but an hour later i had the runs. Have i changed my diet too quickly do you think? Im a little confused. Thanks for writing. First, I would say a “white” pita is not your best bet. It is the type of processed food that does not help a bit. Also, some think that we should not have diary (including yogurt) when we have MS. I suggest you try doing without both gluten dairy and see if you don’t feel better. It is interesting that both of these will give me the runs and that is why I avoid them. At the same time, they did not bother me at all when I was younger (20’s, 30’s). I doubt the seeds caused the problems you describe. Also, it could be you just need to rest. Some days a few extra hours of sleep are just what Mother Nature ordered. And no, you haven’t changed your diet too quickly. The sooner you start eating right, the better!! You do need to ease into higher fiber food a bit but other than that, eating right is key. the most wonderful thing you give me is hope by looking at the smile on your face gives me reason to believe that i can have no more anxiety and heaps more energy. i have taken your sisters route. I am not moving much at all and live in stressful circumstances. my neurologist is poor and she says i am in progressive , which is not true as i dwelt on my symptoms psychologically. i will not die from this but i need to start somewhere and i don’t no how as i am depressed which i think comes with the territory. start with supplements and walking outside every day. Don’t blame yourself for being depressed. With so many doctors so full of gloom and doom, it is hard to avoid depression until you find a group of folks who know it is entirely possible to live long and happy lives despite MS. It is a matter of reading Swank and Jelinek’s books and getting the eating right, taking D3 supplements, etc. Start with the D3, for sure, and soon you’ll be feeling a lot better. By the way, you will probably want to take 14, 000 IU of D3 until you get your vitamin D level at the high end of the normal range. You can have your doctor test your blood to see how much vitamin D you have in your body. If the doctor discounts the importance of D3, it is best just to ignore him or her — a lot of doctors are not up-to-date on their research. Good luck! You can definitely feel better!!!! My heart goes out to you, especially because of the depression, which I think I suffered from in the past, but never admitted it. I agree very strongly with Rebecca that your first step should be to increase your Vitamin D levels – this will have more effect than anything else, in my opinion. I also take a variety of supplements, including Vitamin B12, zinc, magnesium, omega-3 fatty acids etc. plus also LDN, which finally got rid of my footdrop and also helps with bladder issues and fatigue. All the best – you can do it! How long did you take ldn before it improved your footdrop? It was about four months – I gradually increased my dose from 1mg, in increments of 0.5mg, up to 4.5 mg and it was not long after I reached 4.5mg that I noticed my big toe felt different! 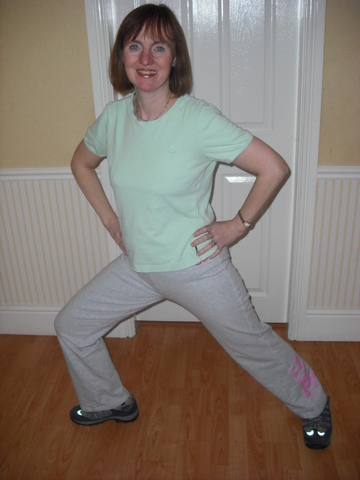 To start with I thought I’d hurt it, but then I realised I was using muscles I hadn’t used in years (it was like doing aeorbics with one foot for the first time and I started to ‘ache’) – this gradually eased and then my foot drop was gone! It is always hard to know exactly what is causing what. In Julie’s case she had been on an ultra healthy diet for two or three years at this point, I am guessing, and it could be the foot improvements happened as a result of that. While one notices benefits quite quickly from Vitamin D3 supplements and eating ultra heatlthy, the benefits are achieved slowly and subtly mainly over the first two to three years but even up to five and more. In any event, viva la healthy living. That’s the base. Just taking LDN is unlike to help. I’ve had MS Symptoms since 1988…I have never taken medication but have relied on prayer and diet…A calm and quiet spirit is very important in getting well as stress places a big part in MS. I can still walk well, but days I feel stiff and spastic in my legs and arms. I used to be obsessed with trying to get 100 % well now I just take one day at a time and rely on God to get me through. I try to stay away from alcohol as this makes my symptoms much worse. I take vitamin D, cod liver oil, ester Vitamin C and I eat lots of fruits and veges. Have a blessed day everyone! Hi, thanks for your comment. I have had MS almost as long as you (since 1991) and am fortunate that most of my MS problems faded away after I started a lifestyle improvement program. I personally don’t use religion as a way to address MS although I think stress management is important. Luckily, I don’t even have problems with stiff legs and arms (probably because I exercise most days). Also, I am not sure whether the quiet matters — I may be more extroverted than you because I find some noisy bustle to be invigorating. I think you would do better with fish oil than with cod liver oil. The research suggests fish oil works better (this research was not available at Swank’s time). Good luck. Thanks for sharing. You story shows that it is possible to live an almost normal life with MS without medication. Dear Rebecca….What is your lifestyle improvement program…I’ve relapsed and am in deep depression and discouragement….I would be interested to know how you got your symptoms to fade away….thank you so much! I suggest you read my tab called Plan for Beating MS and also read http://www.overcomingms.org . Hang in there! Dear Rebecca, Thank you for taking the time and making the effort to help other MSers. I have a sharper brain (brain fog dissapeared), more energy since I started doing meditation and exercise. However, I still have a drop foot, poor balance and sometimes fatigue. I will follow the diet recommended very strictly from now onwards. I am already having the supplements you are recommending. However, I am not sure how much fish oil and flaxseed oil I should take daily. Also, please tell me what specific exercises you did / do for foot drop and the subsequent difficulty in walking. I’m so excited to hear all these positive testimonies! I have been diagnosed for four years, and until the last 5months have been very fortunate with my ms journey. However recently I’ve struggled on and off with vertigo. It’s been very scary, particularly as I feel it impairs my vision (when it really gets going) and my career is in photography. Way yo go amie! Stay with it, even through relapse because it works! Thanks for sharing! I notice that additives worsen symptoms, avoid them Take care Bye! Hey Julie, I’m happy to hear you found your health back with diet, I have Ms as well and also believe our future lies in the food we consume. I wonder, have you ever taken and ms medications? My neurologist is pushing me to start something but I’m just not convinced it would help me.